A Russian Soyuz ferry ship carrying a Russian cosmonaut and two NASA astronauts undocked from the International Space Station early Thursday, flew a lap around the 20-year-old outpost for a photo survey and then plunged back to Earth, making a pinpoint landing on the steppe of Kazakhstan to wrap up a 197-day stay in space. 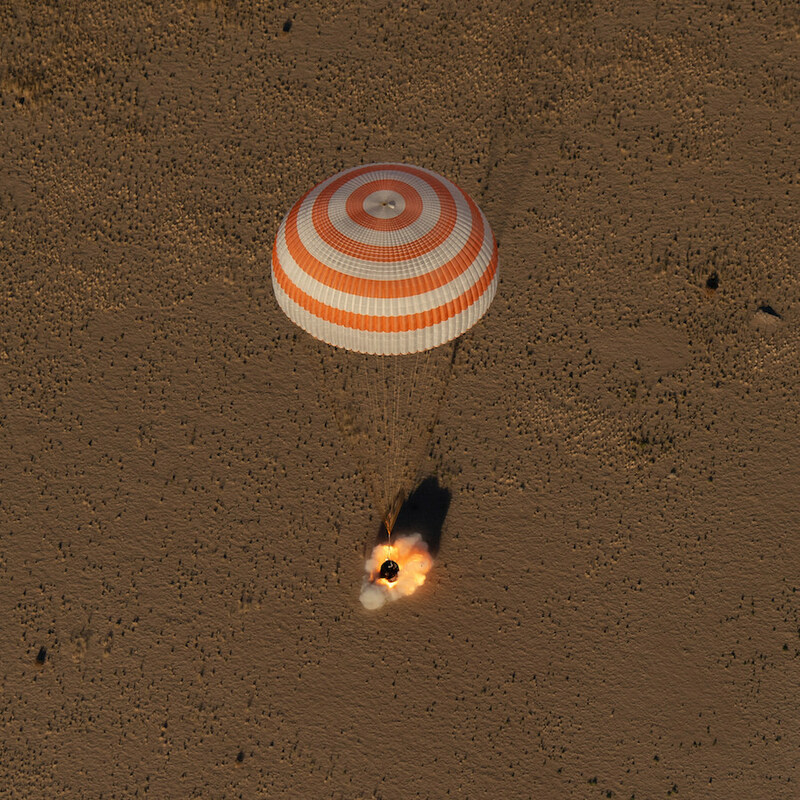 Descending under a billowing orange-and-white parachute, the Soyuz MS-08/54S descent module settled to a jarring rocket-assisted touchdown southeast of Dzhezkazgan, Kazakhstan, at 7:45 a.m. EDT (GMT-4). 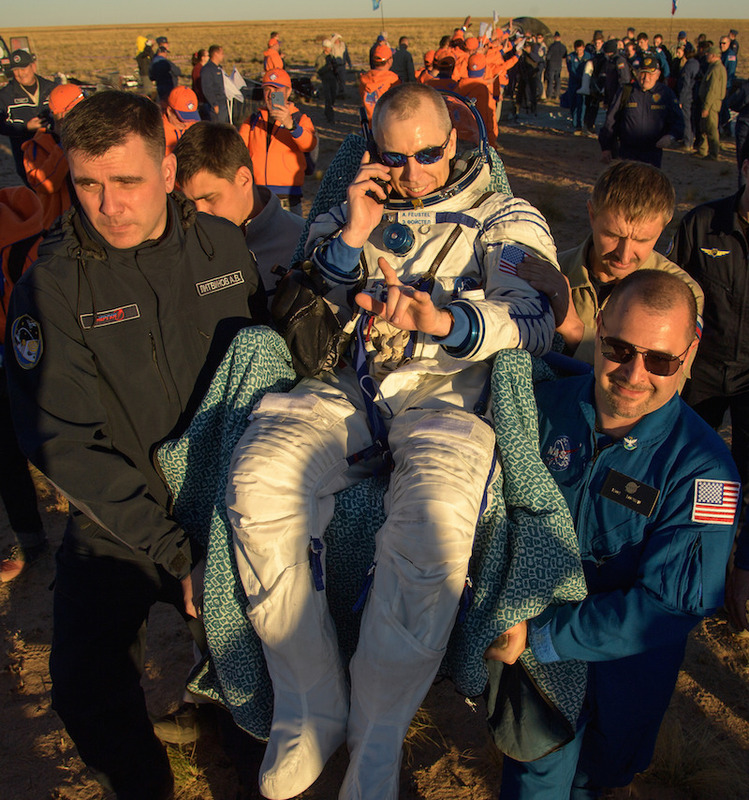 Russian recovery crews stationed nearby rushed to the charred spacecraft to help commander Oleg Artemyev, flight engineer Drew Feustel and Ricky Arnold exit the cramped module as they began their re-adaptation to gravity after six-and-a-half months in orbit. All three appeared fit and in good spirits as they were carried to nearby recliners for an initial round of medical checks and satellite phone calls home to friends and family. Artemyev was presented with fresh fruit, including a large cantaloupe, a squash and a carrot. They began their return to Earth four hours earlier, at 3:57 a.m., when the Soyuz undocked from the space station’s upper Poisk module as the two spacecraft sailed some 250 miles above Madagascar. In a departure from normal practice, Artemyev manually piloted the spacecraft through a partial loop around the station, allowing Feustel to carry out a photo survey of the outpost as it nears the 20th anniversary of the first module’s launch in November 1998. The lab has been continuously staffed by rotating cosmonaut-astronaut crews since October 2000. With the photos in hand, the Soyuz crew departed the area to rig the ship for re-entry. And right on time, at 6:51 a.m., Artemyev monitored a four-minute 39-second firing of the Soyuz’s braking rockets, slowing the ship by about 186 miles per hour and dropping the far side of its orbit into the atmosphere. A half hour later, at an altitude of about 97 miles, the three modules making up the Soyuz MS-08/54S spacecraft separated as planned and the central crew descent module, the only one with a protective heat shield, slammed into the discernible atmosphere at nearly five miles per second. 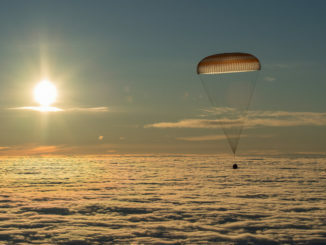 After enduring about 15 minutes of extreme heating and rapid deceleration, subjecting the crew to about four times the normal pull of gravity, the descent module’s main parachute deployed at an altitude of about six miles. 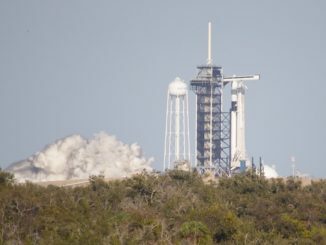 A few minutes later, the capsule dropped to an on-target touchdown, kicking up a cloud of dust as its landing rockets fired an instant before the crew cabin hit the ground. Mission duration was 196 days and 18 hours since launch from the Baikonur Cosmodrome on March 21. Artemyev’s total time in space over two station visits now stands at 366 days. Feustel, veteran of three flights, including a mission to repair the Hubble Space Telescope, has now logged 226 days aloft. Arnold’s total over two station flights stands at 210 days. 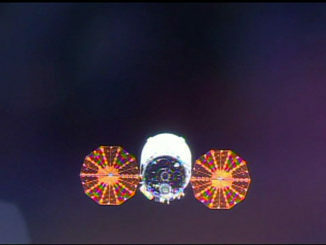 During their stay aboard the station, the trio welcomed three crewmates to the outpost — German astronaut Alexander Gerst, Soyuz MS-09/55S commander Sergey Prokopyev and NASA astronaut Serena Auñón-Chancellor — two SpaceX Dragon cargo ships, a Russian Progress freighter, a Northrup Grumman Cygnus supply ship and a Japanese HTV cargo craft carrying replacement batteries for the station’s solar power system. They also staged four spacewalks. Feustel and Arnold carried out three excursions in March, May and June to perform routine maintenance while Artemyev joined Prokopyev in August for work on the Russian segment of the station. Feustel has now walked in space nine times totaling 61 hours and 48 minutes, moving him up to third on the list of world’s most experienced spacewalkers. The Expedition 56 crew also dealt with a small leak in the Soyuz MS-09/55S spacecraft that carried Prokopyev, Gerst and Auñón-Chancellor to the station in June. The leak was discovered in the upper module of that ferry ship, prompting a quick repair job by Artemyev and Prokopyev who sealed it with epoxy-soaked cloth. After initial medical checks at the landing site, Artemyev, Feustel and Arnold planned to fly by helicopter to nearby Karaganda for a traditional Kazakh welcome home ceremony. From there, the crew will split up. Artemyev will board a Russian jet for a flight back to the Gagarin Cosmonaut Training Center in Star City near Moscow while Feustel and Arnold board a NASA plane for the long trip back to the Johnson Space Center in Houston. Left behind aboard the space station were Prokopyev, Auñón-Chancellor and Gerst, who took over command of the station with Feustel’s departure. They will have the station to themselves until Oct. 11 when two fresh crew members — Alexey Ovchinin and Tyler “Nick” Hague arrive aboard the Soyuz MS-10/56S spacecraft. Soyuz spacecraft normally carry crews of three, but in this case a cosmonaut specially trained to work with a new Russian laboratory module was pulled from the MS-10 flight because the lab’s launch has been delayed.